Texas House Bill 300 / HB 300 became effective September 1, 2012, set forth by Texas Governor Rick Perry. This package is our NEW HIPAA TEXAS STATE HB 300 TRAINING PACKAGE that will fulfill your obligations for 2017-2019. Don’t forget that: Texas HB 300 recertification is mandatory every biennium! Texas HIPAA laws mandate stricter Patient Privacy Protection and enforces stronger penalties for violations relating to your Electronic Health Records (EHR) & Protected Health Information (PHI). Get prepared with our comprehensive easy-to-use, Do-it-yourself HB 300 TRAINING PACKAGE 2017-2019. 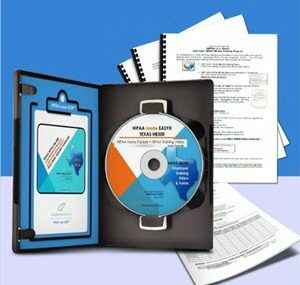 Training videos and printable forms mailed to you on one CD-ROM. Dental Enhancements & HIPAA made EASY™ provides legally useful HIPAA compliance information, products and services but does not give specific legal advice. By purchasing and using these products and services, you acknowledge that Dental Enhancements & HIPAA made EASY™ is not an attorney and suggests that for resolution of specific legal problems you would contact an attorney specializing in these areas and licensed to practice law in your particular area. If you are pending an immediate HIPAA audit, please call our offices to discuss your situation as additional fees or requirements may apply. Dental Enhancements has the right to recommend you seek legal advice in lieu of training and protocol guidance. If for any reason any training material is damaged, we will promptly replace your ordered materials. Simply send us the damaged materials so we can track the problem. We will arrange to pay for all shipping costs. Since most of our HIPAA products are customized, we cannot effectively reuse these materials. Therefore, we do not credit returns but, we will work with you to correct or rectify any challenges you have with any of our products. Our Customized products are replaceable without refund. Keep in mind that we are always available to assist you in making the proper choices with regards to your purchases. We want to be sure you get the materials that are fitting for your office needs. If you have any questions or doubts, give us a call before you press the order button and we can talk about what products will be best for your situation. 941-587-2864.